The Miners Memorial commemorates the coal mining industry in the region. The original statue ,erected by ex-miner Robert McMaster as a tribute to his mates, was demolished after being vandalised in 1987. Sculpted by Barry Wakley, unveiled by Mr Peter McGauran, M.P. on 20th April 1989. 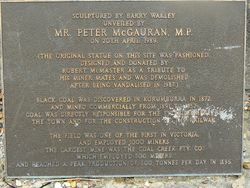 (The original statue on this site was fashioned, designed and donated by Robert McMaster as a tribute to his miner mates and was demolished after being vandalised in 1987). Black coal was discovered in Korumburra in 1872, and mined commercially from 1891 to 1957. Coal was directly responsible for the establishment of the town and for the construction of the railway. The field was one of the first in Victoria and employed 1000 miners. The largest mine was the Coal Creek which employed 500 miners, and reached a peak production of 500 tons per day in 1895.